One thing I’ve learned about pregnancy is that regardless of the weather, you’re hot all the time. I’m a bit embarrassed to admit just how much gelato I’ve consumed in the last few months. Enough to build a slip ‘n slide for a penguin, probably. This is stuff I already eat for breakfast regularly, just in frozen form. A bowl of oatmeal with mashed banana and applesauce or fruit and nuts in creamy yogurt. Entirely healthy and so, so soothing in the summer heat. I chose almonds and nectarines for these yogurt-based popsicles because that’s what I had on hand (and because I’m having a bit of an almond obsession right now.) 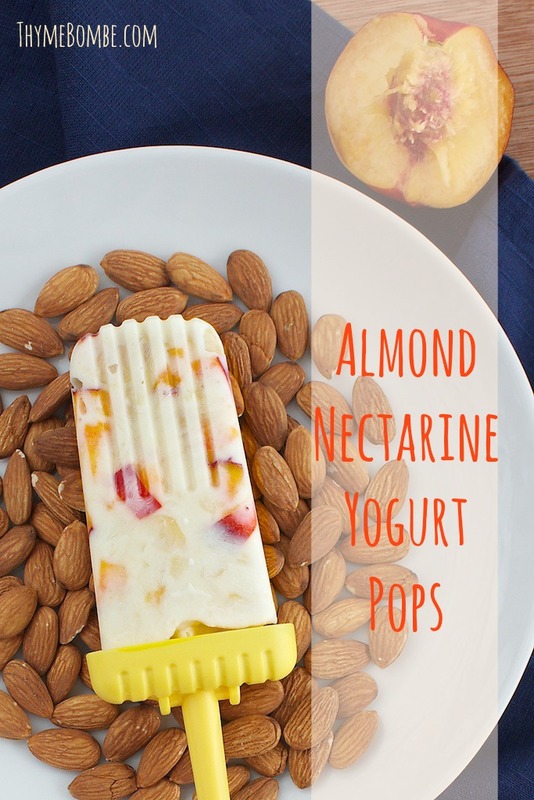 Feel free to substitute any fruit, nuts, or flavored yogurt that you wish, but this combination really was stellar and I found myself making another batch immediately after I inevitably ate all of these in just a few days. Yogurt, fruit, and nuts makes a healthy breakfast that is refreshing when frozen. 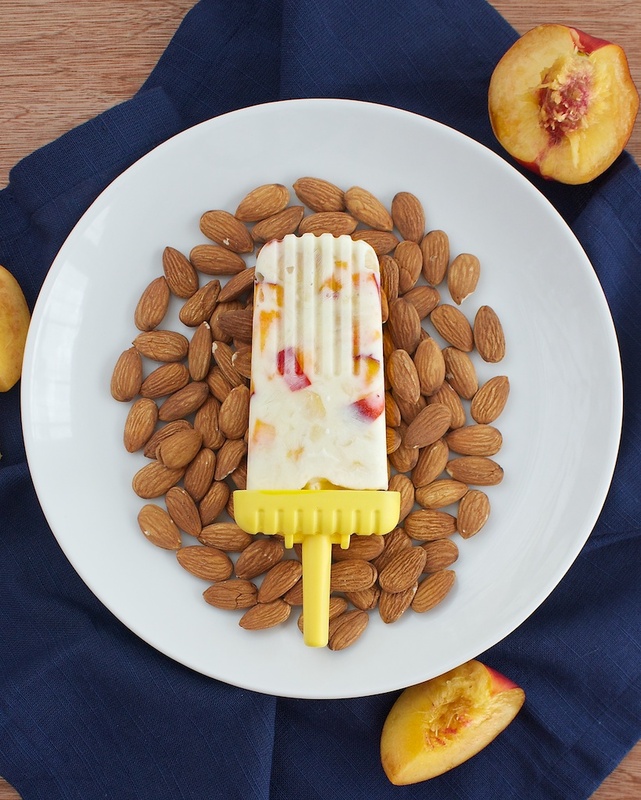 Spoon mixture evenly into popsicle molds and insert handles. To eat: Run mold under warm water until popsicle slides out easily. Another favorite of mine is oatmeal bulked up with a mashed banana and sweetened with applesauce. I was worried that the texture of the oatmeal wouldn’t work very well frozen, but they came out just delightful. They’re a bit chunkier than the yogurt pops, but still break apart easily and dissolve in your mouth. Again, chose your own adventure here. 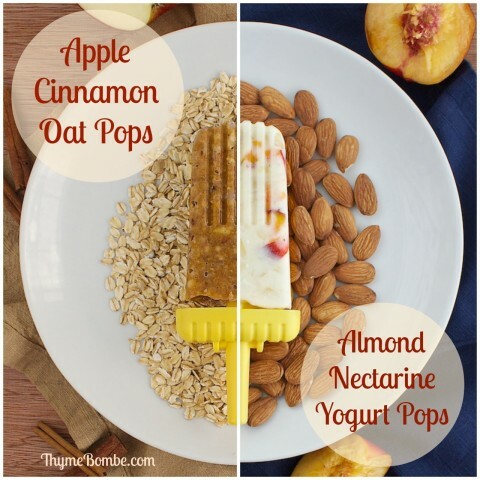 If there’s a flavored oatmeal you’d like to use, go for it. If you’d like to substitute jam or nut butter for the apple sauce, be my guest. You could even use canned pumpkin in place of the mashed banana… mmmmm. 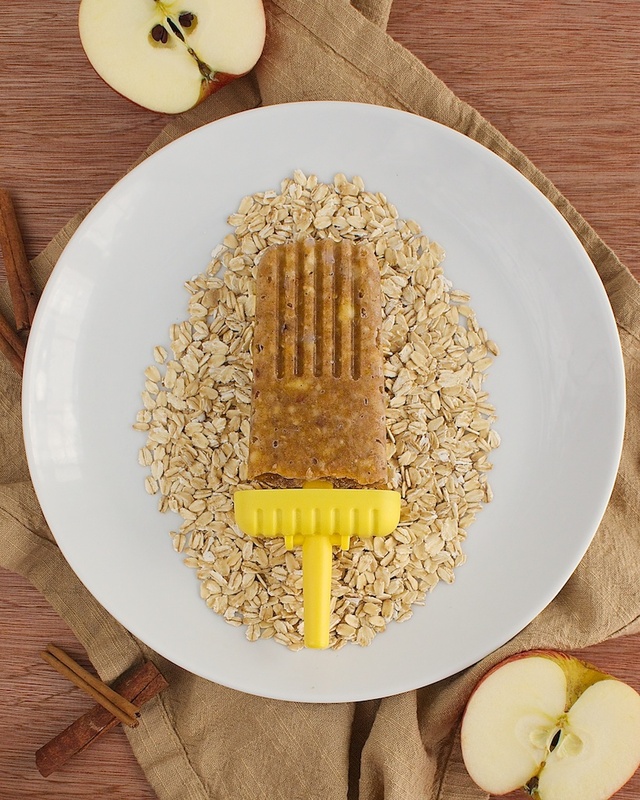 Just like a hearty bowl of hot apple cinnamon oatmeal, but in frozen form. In a microwave-safe bowl, cook oatmeal with water according to package directions. In a separate bowl, mash banana with a fork. 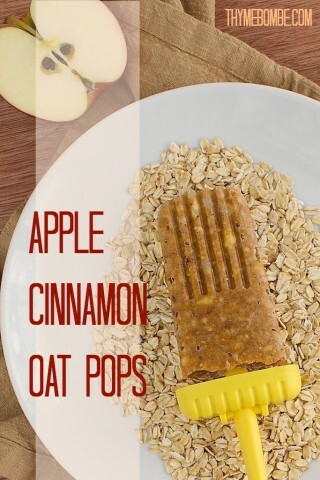 Add oatmeal and all other ingredients and stir to combine. To eat: Run molds under warm water until popsicle slides out easily. I’ve loved being able to grab one of these in the morning to cool off with. They’re pretty low-calorie, so I usually follow them up with a muffin or something. I already have so many ideas for how to freeze more of my breakfasts now. Blueberries and waffle bits in maple yogurt? YES. 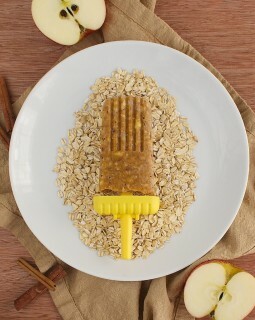 How would you translate your favorite breakfast into a frozen treat? I so appreciate all the congrats from you guys regarding the impending arrival of our little spawn. 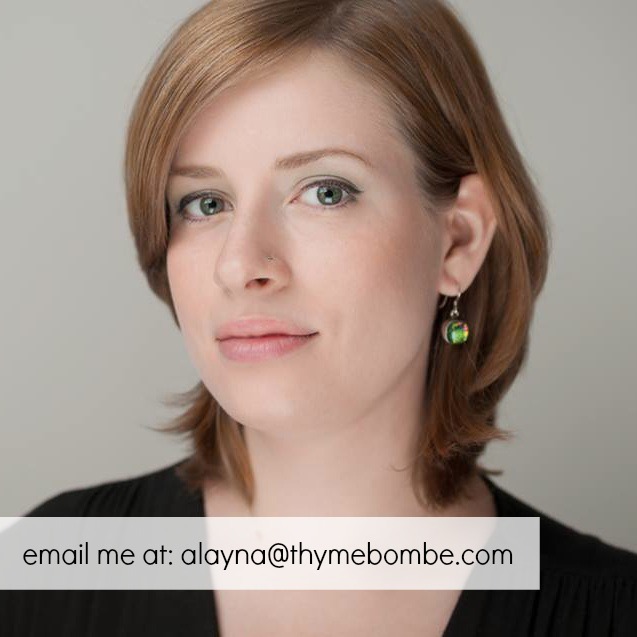 I am due next week and officially in “get all the things done!” mode. I’ve heard over and over again the same advice to stock your house full of foods that are easy to eat one-handed for after baby’s born and you’re carrying him/her around everywhere all the time to keep ’em from screaming continuously. 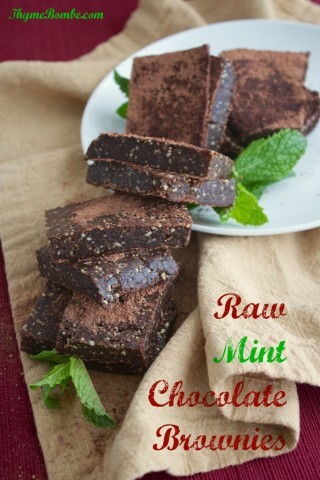 To that end, I decided to make some healthy raw-ish mint chocolate brownies to stuff in my face as needed. 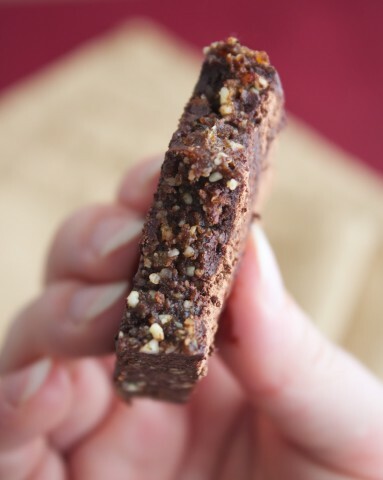 I say raw-ish because I didn’t personally bother to use raw cacao powder or raw flavor extracts in these, but you absolutely could if that’s important to you, it just wasn’t for me. To me, this is raw enough. In fact, I’m letting a lot of things slide lately. Sometimes the dishes don’t get done, and that’s ok. Sometimes I get winded just making the bed and so I just stop half way through. Sometimes the thought of shopping for food makes me want to collapse into tears over a pint of ice cream, so I don’t go and we order out for the 3rd time in a week. Sometimes… my perfectly plated stack of raw mint chocolate brownies topples over before I even get my first shot in, and with a sigh, I decide to just go with it rather than re-plating because it’s a real and accurate depiction of how I’m feeling right now. They may look a bit beat up, but I assure you these brownies were just as tasty after their tumble. They have a high moisture content, giving them a truly fudgey and rich texture. 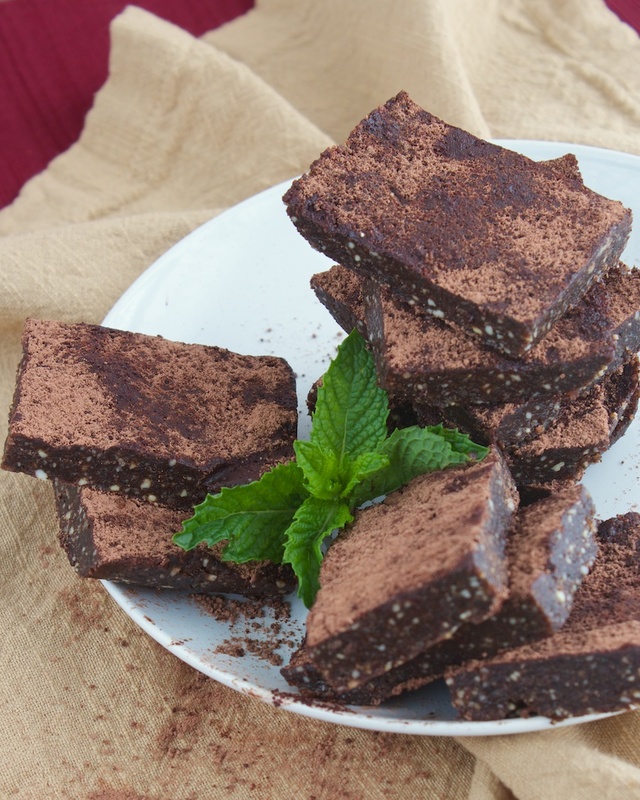 The mint flavor is subtle, herbal, and cuts through the richness nicely. A no-bake and guilt-free chocolatey brownie with a hint of fresh mint. In a food processor, process nuts until small. Add dates and pulse to combine. Add all other ingredients and process until a paste forms and starts to pull away from the sides. Press mixture evenly into a 9x9 pan lined with plastic wrap or wax paper. Dust over extra cocoa powder and freeze for at least an hour. Store in an air-tight container in the refrigerator or freezer. If you would prefer a stronger mint flavor, simply substitute one of the teaspoons of chocolate extract for a mint extract instead. Also, vanilla will be fine if you can’t find chocolate extract too. And if you don’t have one of those nut varieties, just sub in more of one of the others. I like to use macadamias in raw desserts that imitate something that is typically baked because they lend a convincing buttery flavor and texture. I chose walnuts because they tend to deepen chocolate flavors. If all you have is cashews though, it’ll be fine. I personally like to store these in the freezer and eat them ice cold. 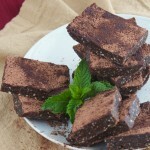 They can be messy and melty at room temperature, and the cold makes the mint flavor pop in a cooling and refreshing way. These will be great to hold me over while the little lady is eating her breakfast, and when she’s done I can worry about making something more substantial to eat. If you don’t already know, I suppose now is as good a time as any to mention that my husband and I are approximately 3 weeks away from the birth of our first child. I’m due with a little lady on July 18th and totally freaking out. A few weekends ago, I hosted a little dinner party at our house in an effort to have one last hurrah with some of our friends before we inevitably disappear down the rabbit hole of new parenthood. I cannot believe I managed to pull it off. I’m massively, uncomfortably, achingly, exhaustingly, deliriously pregnant right now and for some reason thought it was a good idea to cook a fancy dinner for 8 people, the most I’ve ever entertained. Somehow, by spacing the prep work out over a few days and by the gracious help of my wonderful husband, it all managed to come together and everything tasted great. And as a bonus, I actually had the energy to enjoy myself that night rather than collapsing into spontaneous hibernation. Domestic goddess status: Achieved. The menu for the night included a honey soy roast beef shoulder (this recipe can be found in my book,) mashed potatoes, jasmine rice, Thai chickpea and cauliflower curry, baked leek and shiitake wontons, a salad with strawberries, bleu cheese, and pistachio dust, and a dark chocolate berry crumble with whipped coconut cream. 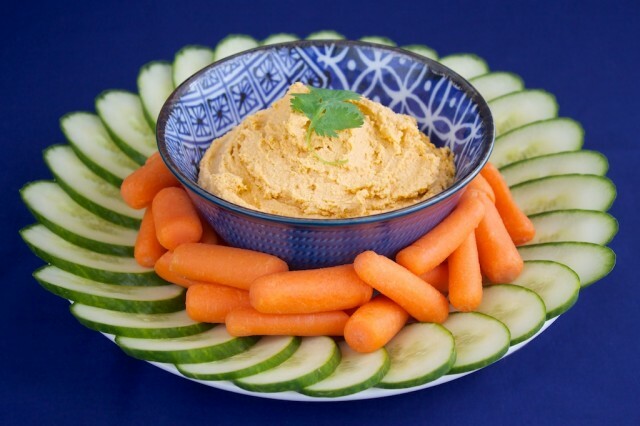 I wondered what the guests would like the most, and while of course everyone swooned over dessert, I was surprised to find that by the end of the night the only dish that completely disappeared was an appetizer plate of sriracha hummus with veggies that took me almost no time to put together. It would seem that it’s always the simplest things that make the biggest impact. This was a total experiment gone right. I just tossed a bunch of stuff in the food processor and hoped for the best. What I got was far better than just edible, it was downright delicious. 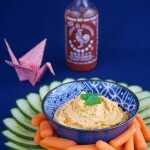 The flavor starts off a bit lemony but otherwise not too unlike a standard hummus, and then it hits you. A deep spicy tickle starts in the back of your throat and quickly rushes forward lighting up all of your tastebuds like thousands of fiery torches. It’s a tingly heat that makes your pupils dilate and little beads of sweat settle on your upper lip. Now that’s my kind of party. 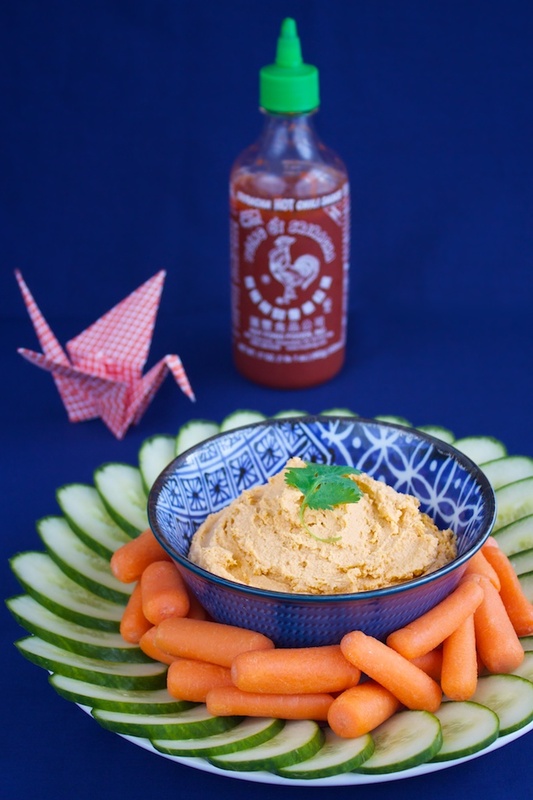 A spicy dip made with fruity sriracha and creamy chickpeas. Add all ingredients except for oil and water to a food processor and pulse to combine. Use a spatula to scrape down the sides and pulse a few more times. While processor is running, pour in oil through the vent in the lid. Process until smooth. If hummus is too thick, add water 1 tbsp. at a time until desired consistency is achieved. Store leftovers in an air-tight container in the refrigerator for up to a week. I used water in this recipe to thin the hummus out to the right consistency, but if you’d prefer you can use the salted water from the can of chickpeas instead, just make sure to scale back the amount of salt you add until you’ve tasted it. This was so good tempered with the coolness of cucumbers, but you can use pita chips if you prefer. If you’re a crazy person, try eating it with peppers. Go on, I dare ya. Supposedly spicy food helps to jumpstart labor. 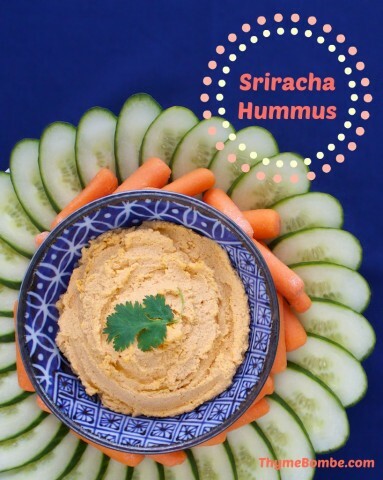 If that’s true, then I may have this batch of sriracha hummus to thank for introducing me to my daughter soon. If nothing else, maybe it’ll help the little lady to develop a taste for spicy food before she’s even born. I sure hope so, I may actually cry if I have to start toning down the heat for family dinners in the future. Mama needs her hot sauce! Do you like super spicy food?